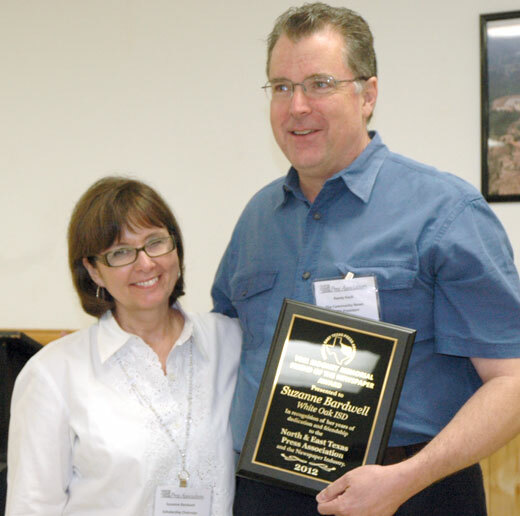 The NETPA board added a special award in 1995 following the death of Tom Mooney, longtime publisher of the McGregor Mirror and a past NETPA president and 1986 Holloway award winner. Dubbed the “Friend of the Newspaper” award, it signifies support of the association at the highest level, and may be awarded either to persons working within the newspaper industry, or to an associate member who faithfully upholds the efforts, goals and ideals of the association. The NETPA leadershp is responsible for selecting the recipient. 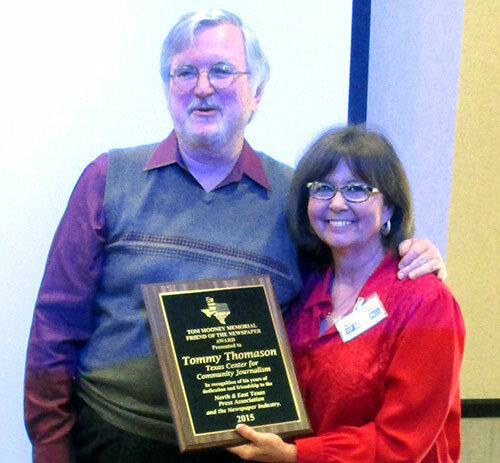 Tommy Thomason (left) of TCJC and TCU being awarded the 2015 Tom Mooney award by Suzanne Bardwell in Denton. Tom Mooney was born Dec. 6, 1923 in Shreveport, La. and lived in Mooringsport, La. until he was 11. After the death of his father he moved to McGregor with his mother and graduated from McGregor High School in 1940. He served in the U.S. Army in Europe during World War Two as a staff sergeant with the 20th Armored Division. He and Bonnie Hall were married Nov. 8, 1944 in Hopkinsville, Ky. After military service, Mooney returned to college and earned a BA in journalism from Baylor University in 1948. He began working at the McGregor Mirror in 1945, attending school in the mornings and working at the paper in the afternoon. When the publisher, his father-in-law Charles B. Hall, died in December 1964, Mooney became editor and publisher of the Mirror, a position he held until his retirement in 1992. He wrote a weekly column, “This, That and the Other.” He died April 8, 1994. Mooney was president of the North and East Texas Press Association in 1987 and served on the board of the Texas Press Association. He received the Sam C. Holloway Award from NETPA in 1986 at Waco. He recorded 48 years perfect attendance in the McGregor Rotary Club, which named him a Paul Harris Fellow in 1980 and inducted him into the Rotary Roll of Fame in 1985. He was active in the First United Methodist Church, serving on the board of stewards, board of trustees and as Sunday school superintendent. He was a manager and president of youth baseball, director of the First National Bank of McGregor, and served 10 years on the McLennan Community College board, a year as chairman. He served on the McGregor Airport committee, chaired the McGregor Housing Authority, and was a member of the MCC Foundation board and Bryant-Oliver Legion Post 273. He was awarded McGregor’s first outstanding citizen award in 1977. He was an honorary member of the McGregor Ambulance Association and was an avid golfer. 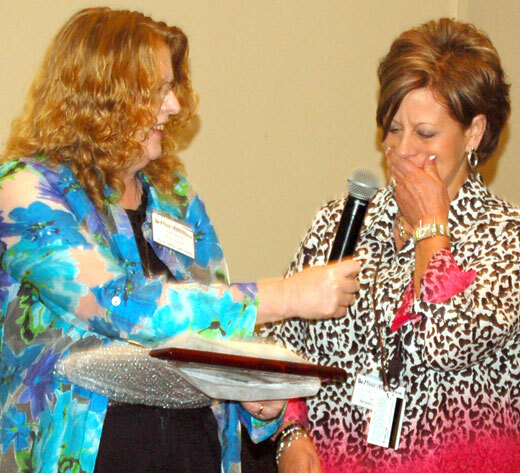 Cher Thompson of Hood County News accepting the 2013 Tom Mooney Award from president Susan Reeves in Durant, OK.